Safety Direct America is a subsidiary of Sotter Engineering Corporation, which was founded by Dr. George Sotter in 1987 and incorporated in 1991. Our mission is to use science and technology to make life better for people. We supply anti-slip/non-skid floor-care products and applications; instruments; and consulting and expert witness services that use technology to improve safety, health and the environment. 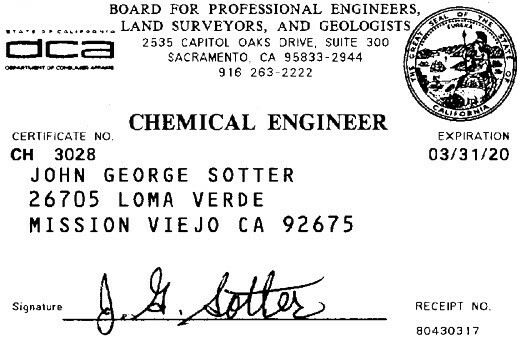 Sotter Engineering Corporation is Licensed by the State of California Board for Professional Engineers and Land Surveyors. We have been testing flooring slip resistance for more than fifteen years. We are also certified by the City of Los Angeles for testing floor slip resistance. Los Angeles is one of the few government agencies in the USA that certifies labs for floor slip testing. In the past, Sotter Engineering has tested flooring and often found that it was slippery when wet. The only option for the property owner was to optimize maintenance, conduct surveillance, give warnings, and implement various precautions to try to prevent the floor from being wet or otherwise lubricated. This did not solve the underlying problem: the floor was still slippery when wet. Some hard flooring can be acid-etched, but this permanently damages the surface, makes it difficult to clean, adversely affects its appearance, and is only a temporary fix. Safety Direct America now has the capability to apply an anti-slip treatment, sell YOU the treatment for application by your crew, or sell you anti-slip coatings to fix any hard or resilient floor to make it slip-resistant dry or wet. We can apply this coating to your bathtubs as well, or sell the product to you for self-application. This includes vinyl, terrazzo, ceramic tile, marble, granite, slate, glass, wood, thermoplastic, concrete and linoleum. We also sell anti-slip floor tapes for any situation. What sets us miles apart from our competitors is that we use reliable slip resistance testing methods to test all of our anti-slip floor solutions. With every reliable and trustworthy non-skid floor solution available through our online store, we truly are the THE Anti-Slip Floor Superstore! Sign up for our blog below…where we discuss everything to do with the latest slip resistance testing methods and standards, and the best slippery floor solutions.